Artists' impressions two years after the horrific Aug Incident. Picture how your city might look in a world post-Aug Incident. Grim, right? 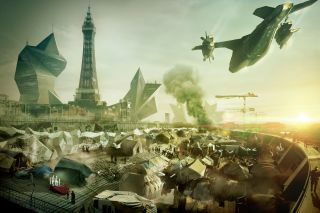 Well, so long as you live in Barcelona, Berlin, Cologne, London, Moscow, Paris, Rio de Janeiro, Stockholm, Sydney, or seaside town Blackpool (featured in the image above) rest that simple organic brain, because the Deus Ex art team has done the imagining for you. Apologies if your hometown isn’t covered, but that might be for the best. I live in Glasgow, so my city isn’t up there either—then again, the art might actually be an improvement. For more Deus Ex: Mankind Divided artwork, check out Andy's look at its grim vision of the future. Deus Ex: Mankind Divided is due to launch August 23.